I first met Andy over a decade ago when I was a clerk for a judge that handled mostly DUI and minor criminal offenses. As a clerk, I was exposed to the best DUI attorneys the state of Washington has to offer. 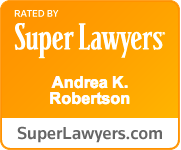 Recently, when I was faced with having to hire an attorney to represent me in a DUI case, my choice was easy, clear, and without any doubt, Andrea Robertson. She listened to me intently and offered expert and thorough answers to all of my questions. Andy is well respected by judges and it shows at every hearing. My case was particularly complicated and required scientific expertise and Andy delivered. She was extremely proficient in explaining the complexities to me in non legalese language to where I understood exactly what to expect. Andy made me feel like I was her only client. She always had time for me. And, oh man! She’s a fighter. Her court presence is impeccable and she is extremely creative. When I came to her I thought I was doomed. The favorable outcome she achieved was unfathomable to me when she first started working on my case. She fought to the bitter end and on the eve of trial the prosecutor offered an extremely favorable outcome that I never thought even remotely possible.